Epazote (Chenopodium ambrosides) is an herb that is used in Mexican cooking (sometimes even referred to as “Mexican herb”). It’s difficult to describe the flavor. I’ve asked a number of customers at the farmers’ market who have used it and we agree that flavor is a bit like cilantro (or culantro) with a bit of citrus thrown in for good measure, with perhaps a bit of bitterness. It is one that has become a part of my kitchen garden each year now. It’s not really a pretty herb, but it is tasty. (Image from Mountain Valley Growers). It is a tender perennial (dies back to the ground at frost but emerges again in the spring) hardy to USDA zone 8. 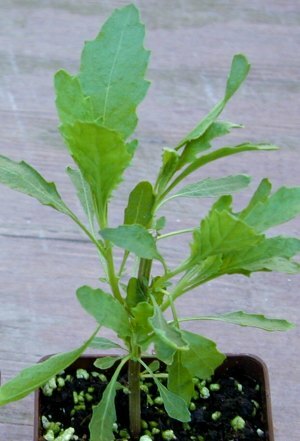 It is an heat-loving herb that will develop best flavor in full sun. It is tolerant of some, but not complete, drying out. In colder regions it may be over-wintered indoors. Young leaves can be treated like sorrel–added to other greens, wilted and added to soups, but use sparingly until you’re acquainted with the taste as it can be potent. It is said to reduce the flatulence that can occur after eating beans, and had other medicinal uses by Aztecs. As with most herbs, I think it is best used fresh, although it can be dried, and is available from Penzeys Spices. That is how I first used it, but extrapolating from that use, I decided that I wanted to try the fresh herb–and it’s become permanent part of my herb garden. If you find it impossible to get French tarragon (Artemisia dracunculus sativa) to thrive, but would like a reasonable tarragon flavor, the you might want to investigate Spanish tarragon (Tagetes lucida) or Mexican mint marigold. This plant does better in hot, humid weather than French tarragon. It is an annual/tender perennial that likes sun, even moisture (but not wet feet) and average soil. It can be up to 3 feet in height. 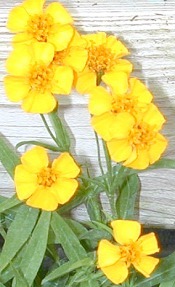 The flavor is anise/licorice rather than what you expect of other “marigolds”. It is a better substitute for French tarragon than is Russian tarragon. In recipes calling for French tarragon, you can substitute this herb is the same quantity. It does break down more quickly than French tarragon with cooking so might need to be added later, or additional added at the end of cooking if the flavor has weakened with heat. In vinaigrettes, flavored vinegar and sauces it can be used as French tarragon. Good with eggs, chicken, mild seafood and tomatoes as is French tarragon.